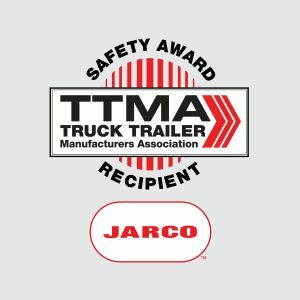 Salem, IL – (May 7, 2018) – Jarco, an EnTrans International, LLC, brand, recently received a Plant Safety Award from the Truck Trailer Manufacturers Association (TTMA) for its Salem, IL, plant. The award was presented to Todd Finney, Senior Vice President of Operations at EnTrans International, LLC, at TTMA’s 76th annual convention in Santa Ana Pueblo, New Mexico, on April 19. Jarco received the TTMA Plant Safety Award for the Most Improved in the Tank Trailer Division for 2017. The 50,000 square foot, state-of-the-art Salem manufacturing facility was opened in 2015. Barrels used in the production of Jarco tank trucks are sourced through EnTrans International’s Juarez plant, also a TTMA award recipient. In addition to Juarez, the Salem facility is an ASME U certificate holder and a National Board R certificate holder. For more information about Jarco, visit jarco.com. Jarco has been manufacturing quality tank trucks since 1959. Jarco tank trucks are custom-designed and built for the transport of refined fuels and propane. Jarco is owned by American Industrial Partners, an operationally oriented middle-market private equity firm that makes control investments in North American-based industrial businesses serving domestic and global markets. Jarco, Heil Trailer International, LLC, Polar Service Centers, Polar Tank Trailer, SERVA and Kalyn Siebert are part of EnTrans International, LLC, a leading manufacturer of tank trailers, oilfield capital equipment and related components used in the oil & gas industry. SERVA and Kalyn Siebert are part of the energy division of EnTrans. Jarco is headquartered in Salem, Illinois. For more information about Jarco, visit jarco.com. ← It is TRADESHOW SEASON!